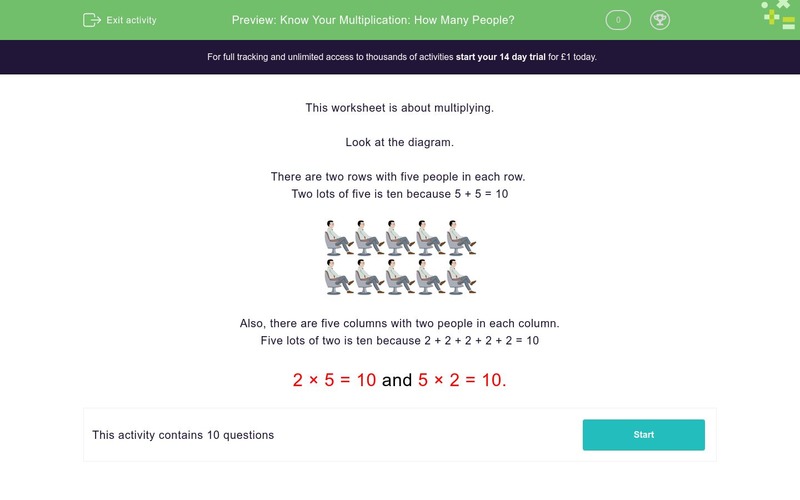 In this worksheet, students answer questions that require them to use their multiplication skills. This worksheet is about multiplying. There are two rows with five people in each row. Also, there are five columns with two people in each column. 2 × 5 = 10 and 5 × 2 = 10. Look at the diagram and answer the question. There are 3 seats in each row. There are 7 seats in each row. There are 5 seats in each row. There are 10 seats in each row. There are 3 in each row. There are 4 seats in each row.